Andreas Cellarius (c. 1596 – 1665) was a Dutch-German cartographer, best known for his Harmonia Macrocosmica of 1660, a major star atlas, published by Johannes Janssonius in Amsterdam. Andreas Cellarius, illustration of the Copernican system, from the Harmonia Macrocosmica 1660. He was born in Neuhausen ,now a part of Worms, and was educated in Heidelberg. The Protestant Cellarius may have left Heidelberg at the onset of the Thirty years war in 1618 or in 1622 when the city came in Catholic hands. His activities are unclear at this time but based on his later works it is conjectured he spent time in Poland and may have even worked as a military engineer there. In 1625 he married Catharina Elt(e)mans in Amsterdam, where he worked as school master of a Latin School. After a brief stay in The Hague, the family moved to Hoorn. From 1637 until his death he was rector of the Latin School in Hoorn, where Pieter Anthoniszoon Overtwater was conrector. Striking map of the  ancient constellations of the Southern sky set against a globe showing the South Pole,listed as Terra Incognitae. southern South America and Africa. 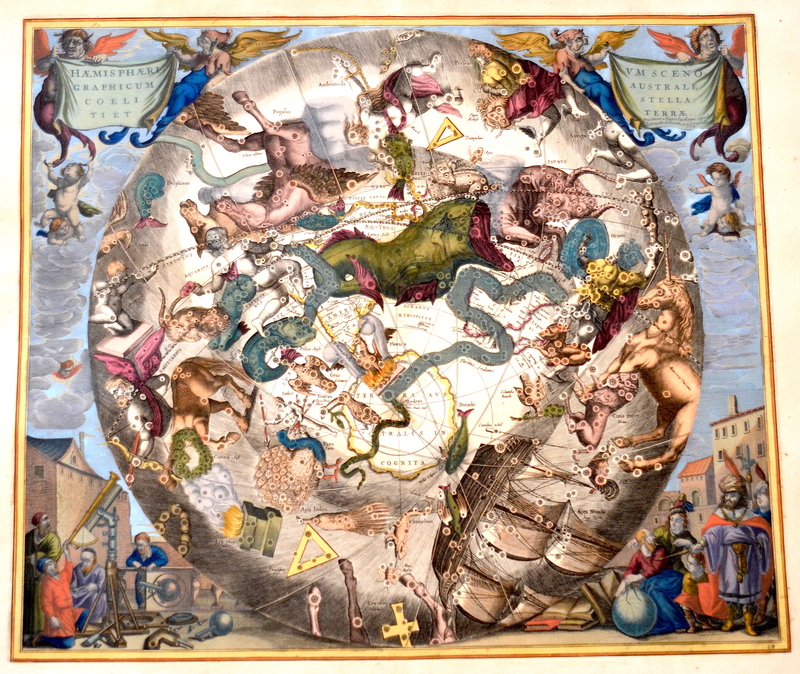 Richly engraved in the baroque style and surrounded with an elaborate cloud background with putti in the sky and astronomers surrounded by instruments below. The article was placed in the shopping cart.